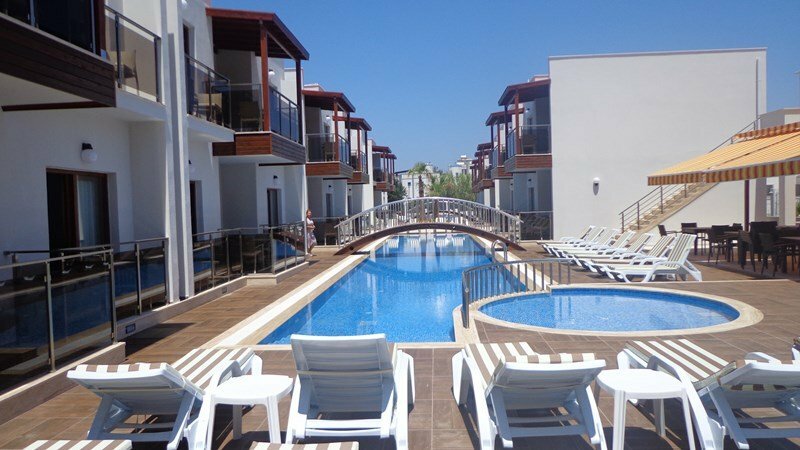 Luxury 1 bedroom modern and high spec, luxurious ground floor apartment situated in a small complex and only 50 metres to the sandy beach of Turgutreis. Flat area, close to shops and restaurants. THİS İS POPULAR PLACE, BEST PRICES GUARANTEED, BOOK YOUR PLACE NOW BEFORE İT GETS FULLY BOOKED. Self catering 1 bedroom 1 bathroom, modern and high spec, luxurious ground floor apartment in a small complex of 24 apartments situated only 50 metres from the beach in the bustling marina resort of Turgutreis, on the most westerly tip of the Bodrum peninsula. Private balcony with BBQ, large communal swimming pool, café/bar - perfect bliss! Poolside / Facilities : Communal swimming pool, children's paddling pool, sunbeds, sunshades, poolside cafe/bar, close to beach. Turgutreis is the second largest town on the Bodrum peninsula. It is named after Admiral Turgut Reis who was born in the village of Karabag which overlooks Turgutreis on the hillside above the town and where there is a statue to the Admiral in the village square. Turgut Reis was also known as "Dragut" he died of his wounds at the siege of Malta on 23rd June 1563. The town holds a three day festival around June 23rd each year, when Turkish naval warships visit the bay and military bands and entertainers hold concerts in Ataturk Square. Because of its suitable winds, the Turgutreis coast is favoured by professional wind surfers. Because of the market day on Saturdays, it also attracts many people. This volcanic area is interesting and offers possibilities for walking and trekking tours. Visitors enjoy the volcanic landscape which is very dramatic and impressive. There are four large supermarkets and numerous local shops. There is also a new marina opened in 2005 where outlets for Armani, Helly Hanson,Gat etc are found as well as more up market but not over priced eateries. It is worth using the Turkish restaurants as well as the touristy ones as they are good value and the food is excellent. Turgutreis is a quieter option to the more touristy resorts close by such as Bodrum and Gumbet.There is a good beach and as it is on the tip of the Bodrum peninsula. The water quality is very good due to the currents passing through between the headland and adjacent islands.The Greek islands of Kos, Pserimos and Kalymnos are close by and from June to October the ferry leaves Turgutreis for day visits to Kos.The 14 small islands, located close to Turgutreis, are used by farmers as additional pasture land for their animals and by the local fishermen for fishing. These islands and beautiful coastline offers great possibilities for boat, diving and sailing tours. Turgutreis is a departure point for many buses traveling all around Turkey. Daily boat trips can be taken from Turgutreis departing to Gumusluk, Karaincir, Akyarlar and Yalikavak. Local buses (dolmus) go to most local villages as well as Bodrum and are a cheap way of getting around. Other places worth a visit by bus are Yalikavak, Gumusluk, Akyarlar, Karaincir and buses to these run about every 20 mins or so until late at night. Beaches :The beaches of Turgutreis stretch for 19km and consist of dark sand, pebbles and in places, rocks. Sunbeds and umbrellas are available and there are limited watersports. Remaining shallow well out to sea, this is a good place for small children. Eating out : Being a harbour town, tasting the seafood here is a must and there are several restaurants to choose from. Local cuisine is readily available, while English tastes are also catered for, with over a hundred eating places! Nightlife: There's plenty of live music and bars to keep you entertained in the evenings, plus a few discos. This is a well-established resort that knows how to please its guests. Shopping: There's a market every Saturday where visitors can pick up leather goods, jewellery and rugs. Otherwise the main shops are the standard souvenir variety, with some convenient general stores. Local information : A few miles outside of the town you can see the ruins of the original walled city, with ancient fountains and graveyards. The Greek islands of Kos and Rhodes make great day trips from Turgutreis and the ancient site of Ephesus is not too far away. An impressive medieval castle built by the Knights of Rhodes guards the entrance to Bodrum's dazzling blue bay, in which the Aegean and the Mediterranean Seas meet. The town's charm is well-known, attracting a diverse population of vacationers who stroll along its long palm-lined waterfront, while elegant yachts crowd the marina. Not far from town, you can swim in absolutely clear, tideless, warm seas. Underwater divers, especially, will want to explore the numerous reefs, caves and majestic rock formations. The waters offer up multicoloured sponges of all shapes and sizes, octopus and an immense variety of other aquatic life. The reputation of Bodrum's boatyards dates back to ancient times, and today, craftsmen still build the traditional yachts: the Tirhandil with a pointed bow and stern, and the Gullets with a broad beam and rounded stern. The latter, especially, are used on excursions and pleasure trips, and in the annual October Cup Race. Bodrum has gained a reputation as the centre of the Turkish art community with its lively, friendly and Bohemian atmosphere and many small galleries. This community has encouraged an informal day-time life style and a night-time of excitement. The evenings in Bodrum are for sitting idly in one of the many restaurants, dining on fresh seafood and other Aegean specialties. Afterwards nightclubs (some with cabaret) and superb discos keep you going until dawn. One of the best is Club Catamaran : www.clubcatamaran.com Bodrum, known in ancient times as Halikarnas which was the capital of Caria, was the birthplace of Herodotus and the site of King Mausolou's Tomb (4th century B.C. ), one of the Seven Wonders of the Ancient World. In the harbor, the Bodrum Castle, or the medieval castle of St. Peter, is a fine example of 15th century crusader architecture, and has been converted into the Museum of Underwater Archeology, with remains dating as far back as the Bronze Age. The stunning panoramic view from Goktepe, nearby, is much photographed by visitors to the Museum's 2nd century theater. The beautiful Bodrum Peninsula suits holidaymakers interested in a subdued and relaxing atmosphere. Enchanting villages, with guesthouses and small hotels on quiet bays, dot the peninsula. On the southern coast, Bardakci, Gümbet, Bitez, Ortakent, Karaincir, Bagla and Akyarlar have fine, sandy beaches. Campers and wind-surfers enjoy Gümbet, and at Bitez colourful sail boards weave skillfully among the masts of yachts in the bay. On shore you can enjoy quiet walks through the orange and tangerine groves bordering the beach. Ortakent has one of the longest stretches of sandy beach in the area and offers an ideal place for relaxing in solitude. One of the most beautiful beaches on the Bodrum peninsula, Karaincir, is ideal for lively active days by the sea and relaxed, leisurely evenings with local villagers. Finally, Akyarlar enjoys a well-deserved reputation for the fine, powdery sand of its beach, it's also considered as one of the best beaches in the world. Turgutreis, Gumusluk and Yalikavak, all with excellent beaches, lie on the western side of the peninsula and are ideal for swimming, sunbathing and water sports. In Turgutreis, the birthplace of a great Turkish Ottoman admiral of the same name, you will find a monument honouring him. In the ancient port of Myndos, Gümüslük, you can easily make many friends with the hospitable and outgoing local population. In Yalikavak white-washed houses with cascading bougainvillea line narrow streets. Small cafes and the occasional windmill create a picturesque setting. A great family day out with free shuttle service for all the family (no entry charge for children under 6 years of age) at the largest water and amusement park in Turkey (40,000 m2) with 5 pools and rivers (including Wave Pool) and 24 slides, Are you brave enough to try the Kamikaze Slider? Take a trip back in time to the worlds of the ancient mariners who sailed to meet their destiny, shipwrecked on Anatolian shores, and to the medieval Age of the Knights of St John who built Bodrum Castle from stones that once were part of one of the Seven Wonders of the World. Home to 27 horses, German, English, strong Haflinger ponies, Arabian Turkish mix-breed mares, suitable for beginners to advanced riders. Horse riding lessons, pony trekking, horse safari, dog handling/training centre (44 kennels), mini zoo and play area, restaurant/café, Sunday brunch (0900-1400) -15TL. A stunning and modern shopping, culture and entertainments centre (5 cinema complex) with open air areas, breathtaking water features, water lily pools, palm trees, bougainvillea and ancient olive trees. Recommended: Chinese Inn Restaurant open buffet lunch (Monday to Friday). Set in 15 acres of land with restaurant/café and day spa, 200mt long driving range, practice putting area, pitching - chipping areas, bunkers and a 5-hole course (first hole PAR 4, the others PAR 3.